Most people never view a rocket launch in person, but more than 1,500 people watched the next closest thing at a NASA facility Oct. 19 – a verification test of a rocket engine that will power a crewed mission to space. NASA conducts a lot of rocket engine tests at Stennis, many on developmental engines in order to collect performance data or to verify the readiness of a particular engine component. This particular test was conducted on RS-25 engine E2063, a complete flight engine. Four RS-25 engines like this one are used to power each flight of the new Space Launch System (SLS) rocket. Using data from the successful test, NASA engineers now proceed with flight certification for the engine for use on an actual flight of the new SLS rocket. The test was conducted in the same manner and for the same length of time that will be needed during an actual launch. The idea is to replicate as close as possible how the engine will be used on a mission. Thus, the test countdown to ignition is largely the same as during a launch, the way the engine is fired and throttled is the same and the length of time it is fired is the same. The only difference between how the engine fires during a test and during a launch is that one remains anchored in place on a test stand while the other actually leaves the ground. Since an anchored engine does not leave the ground, open house participants experienced the full 500 seconds of the test. During a launch, the rocket rises rather quickly out of sight and hearing range. Participants also enjoyed more of an upfront view. A launch must be viewed from at least three miles away; a test is viewed from about half a mile. It is loud enough to wear ear plugs, close enough to feel the vibrations of its power. If the wind blows right, the pure water exhaust from the engine can even condense and rain down on the crowd. Engine E2063 is scheduled for use on NASA’s second mission of SLS and Orion, known as Exploration Mission-2 (EM-2). The first integrated flight test of SLS and Orion, Exploration Mission-1 (EM-1), will be an uncrewed final test of the rocket and its systems. The EM-2 flight will be the first to carry astronauts aboard the Orion spacecraft, marking the return of humans to deep space for the first time in more than 40 years. The Stennis open house event drew participants from across the Gulf Coast region for a chance to view site facilities, learn about NASA’s deep-space plans, enjoy space-related exhibits and celebrate the 56-year history of Stennis. NASA announced plans to build the rocket engine test site in south Mississippi Oct. 25, 1961. Construction involved as many as 6,000 people, representing the largest construction project in Mississippi and one of the largest in the U.S. at the time. The first test at Stennis (then known as Mississippi Test Facility) was conducted on the A-2 Test Stand April 23, 1963. The site subsequently tested all of the Saturn V engines and stages that carried humans to the moon during the Apollo Program. Stennis began testing for the Space Shuttle Program in 1975. During the next 34 years, it performed more than 2,300 space shuttle main engine tests, totaling more than 820,000 seconds of accumulated hot-fire time. The site tested the main engines that powered each one of 135 space shuttle missions. 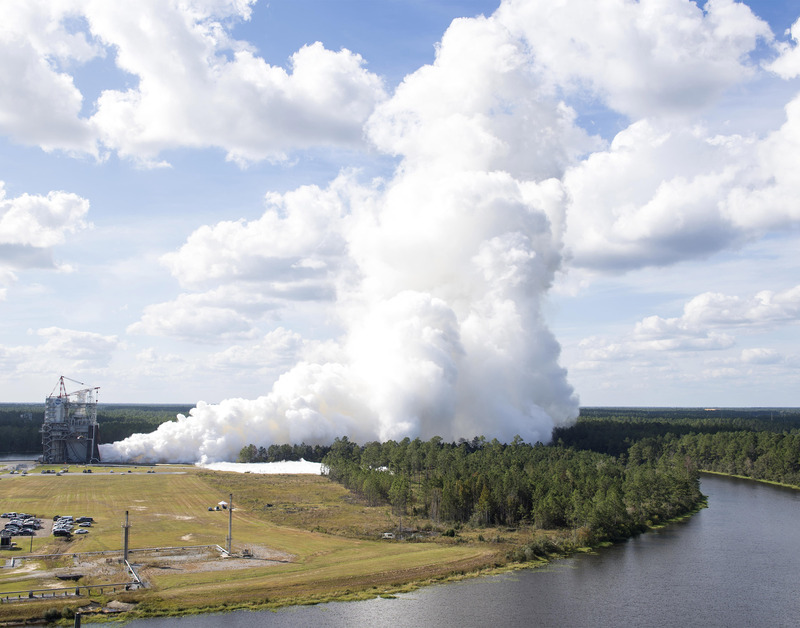 The site now is assigned to test all RS-25 engines for the SLS Program. NASA also will test SLS stages at Stennis, including the core stage that will be used on the EM-1 flight.